If you’re looking for a fun new hobby for 2019, we’ve got something awesome to check out. Shop the AndroidGuys Deals Store and you’ll find the Complete Raspberry Pi 3B+ Starter Kit & Course Bundle with a steep discount. Remember those sci-fi movies and TV shows that promised smart homes with remotely controlled lights and sensors? That’s no longer a fantasy; it is common among many newer houses and offices. A lot of what can be done with building and programming such tech revolves around a Raspberry Pi. The pint-sized, next-gen microcomputer is an incredibly cool device that can be tapped for all sorts of potential. It has kicked off a new age of discovery and development for people of all ages. Our bundle teaches you everything you need to get started and into automating your home or other projects. There’s all sorts of cool stuff you can do with a Raspberry Pi, including a weather station, photo booth, streaming internet radio, and even your own Amazon Echo. Wouldn’t it cool to harness that tech for yourself? 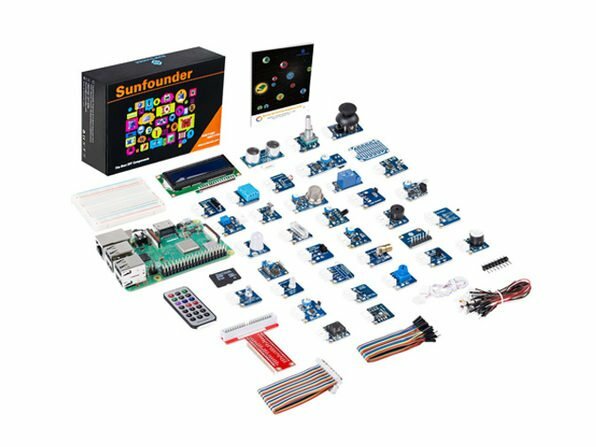 The Complete Raspberry Pi 3B+ Starter Kit & Course Bundle comes with 37 sensors and more than ten hours of training. It’s everything you need to not only familiarize yourself with the tech, but to start programming with it, too. We’re talking more than 175 lessons with lifetime access. You can purchase the Complete Raspberry Pi 3B+ Starter Kit & Course Bundle from the AndroidGuys Deals Store for only $139.99. Normally, the starter kit and training would run about $450, so take advantage of the limited-time savings!